Flare x2 – There are so many hunters that I come up against that this becomes very useful. Hunters are very reliant on their traps. I have also been coming up against a lot of mages and paladins. Remove these if you aren’t fighting many of these classes. Due to its card draw, flare also condenses this build, keeping it focused on weapons, traps, and the beast combos. So its useful even against non secret classes by squeezing flare into a turn where you had a spare 1 mana. Timber Wolf x2 – Combos well with unleash the hounds and later on in the game, with other beasts if you have several beast drops on board already. Due to its 1 mana cost you can draw an extra card cheaply with buzzard out, essentially turning this thing into a 1 mana novice engineer with +1 to all beasts. Explosive Trap x2 – Every hunter deck should roll with these. Much needed aoe. Always keep this at starting pick!! Even if you have to trade it for a single 2 drop, it’s worth it as it’s 1:1 plus 2 dmg to enemy hero. Misdirection x1 – good for preventing dmg to hero and sometimes killing enemy hero. can also enemy minions to kill each other. Unleash the Hounds x2 – Amazing card now with the patch. Combo with buzzards, hyenas, timber wolves, dire wolf alphas. Many possibilities with this deck. Dire Wolf Alpha x1 – This go so well with unleash the hounds, and can also be dropped turn 2 (or 1 w/coin) to stop 3/2 minions and the like. With UTH, you can put the dire wolf next to one hound, then attack and lose that hound, then the next hound is adjacent to dire wolf for its bonus, then the next, etc. Works just as good as a timber wolf in that situation. Can also stack nicely with timber wolf. Ironbeak Owl x1 – Most every deck needs a silence and this is the easiest one to drop. It also counts as a beast for buzzards and hyenas to benefit from. 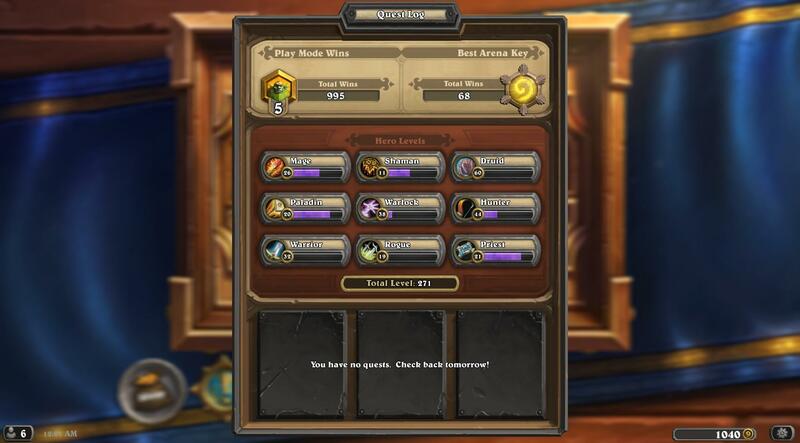 Vs paladins always save this for tirion. River Crocolisk x2 – A durable 2 drop. These survive 2/1 stat 1 drops and 2/2stat 2 drops so very useful early on. They go well with houndmaster becoming a tough 4/5 minion with taunt. You can replace one croc with a raptor if you want to be more aggressive. Scavenging Hyena x2 – Combo with other beasts, particularly unleash the hounds. can be dropped with a uth and sacrificing the hounds for a big hyena. Works even better if you can drop a charging rhino to play the hyena the same turn. If you can play two hyenas at a time it is really good. Forces opponent to buff one when they kill the other… or silence. Starving Buzzard x2 – With the unleash buff, these are back in style! Works good with all the low cost beasts in this deck. Eaglehorn Bow x2 – Always keep this at starting pick!! Eaglehorn beatdowns are so important and the build currently runs 4 traps so you can get plenty of charges. Animal Companion x2 – Every hunter build should have 2 of these. It may be rng but regardless of what you get it’s worth more than the 3 mana it costs. Deadly Shot x1 – Needed against single big drops or to take board control back. Sometimes I add one deadly shot from deck depending on how many druids and warlock giants I am seeing. 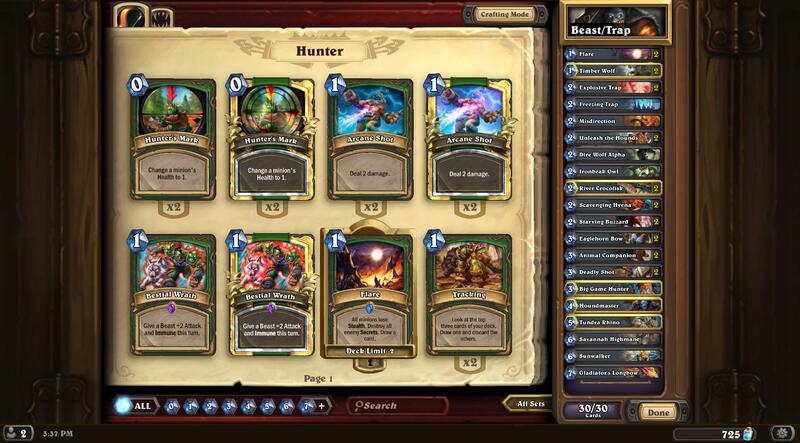 Big Game Hunter x1 – To stop OP ragnaros, giant builds, druids, and the occasional earth elemental. This card is not needed at lower ranks, especially if you are on a budget. Houndmaster x1 – Acts as a dmg buff and a taunt in a pinch, and also does good dmg itself. I went with 1 cause of the decks I’m facing, but 2 are always good. You can scrap BGH or flare for a second if those aren’t working for you. Stranglethorn Tiger x1 – They almost always survive to deal dmg and can be a huge 7/7 with houndmaster. Tundra Rhino x1 – Very useful given how many beasts are in this deck. If you can get away with it, turn 5 rhino and turn 6 highmane is awesome. Rhino can also be used as a 2 dmg charge while giving opponent a huge threat. Savannah Highmane x1 – Best beast out there. A second highmane isn’t a bad idea, even dropping stranglethorn tiger for it. Sunwalker x1 – I added this recently to deal with aggro decks and paladins that I’m facing. A turn 6 sunwalker can help hold off long enough to stabilize or kill them before they kill you. Gladiator’s Longbow x1 – If you had to craft one hunter epic this would be it. Works good for clearing the board, finishing the hero, or putting more pressure on. Play beasts and try to keep the board under control. The build’s focus is to combo your beasts together and use unleash the hounds to do any of the following things: draw cards, buff hyena, clear board, or finish hero. You will use your hero power frequently along with eaglehorn to beat downs to get enemy hero into kill range. It is essential to combo in this build. Starving buzzard + unleash the hounds for card draws is worth it if there’s at least 2 enemies on the board. If you can manage it, starving buzzard+hyena+unleash is awesome. The hounds die and give the hyena +2/+1 for every one that dies. You get cards, sacrifice the hounds to clear the board some and have a huge hyena at the end of it. If you can throw a timber wolf or direwolf into that mix, all the better. 2 attack hounds clear things fast. 2 buzzards + uth is a ridiculous draw combo. Note that you can draw combo even without uth, if you have the mana and several cheap beasts in your hand. There are other combos to think about. If you have say one beast already in play, you could drop double hyena the next turn and get that beast killed to buff both hyenas. Even if one hyena is removed at that point, the other will be buffed even more. Play around with UTH tactics. For example, sometimes it is worth it to cast uth against just 1 enemy minion with 1 HP if you need to clear it. Use traps to your advantage. Misdirects will often do decent to high damage to the enemy hero, either through his own minions attacking him, or the hero attacking his own minions with his weapon. Sometimes misdirects make for a great card removal or double card removal (two high dmg minions attacking each other.) Freezing traps and misdirects keep the enemy minions away from hitting you. (Explosive traps will also keep 2 hp and under minions from hitting you altogether, even if its the one attacking your hero.) Note that misdirection becomes useless if you have freezing trap also active. Explosive shot used to be in this build but was scrapped. If you’re having trouble with several minions you can try removing one deadly shot and adding an explosive shot. Kill command also used to be in this build but I found it lacking for what I was facing. It is still worth trying if you find any of the spells I have in there not to be useful against what you typically face. Add king krush into the deck if you have it. Add Leeroy if you have it. It is overpowered right now with UTH as it gives the enemy two minions meaning you get two extra hounds. Even with 0 enemy board presence, leeroy+uth is an instant 8 dmg on the enemy hero for 6 mana. You can drop hyena, flare, BGH, or stranglethorn tiger for this card.